Making A Submission Is Easy! 1) Choose from these four submissions below. 2) Click the copy button to copy the submission. 3) Then click here to go to the Government's submission page. 4) Add your personal details, paste in the text you've already copied, and you are done. I support international agreements that address the challenges of the 21st century: climate change, Treaty justice, inequality and poverty, ending corporate rule by and for the 1%, survival of the planet and all its species. The Trans-Pacific Partnership Agreement, in any form, does the opposite. That is why I oppose it, and why I demand that you, as our elected representatives, provide a real future for us and our children’s children, as set out in the petition presented to Parliament on 8 March 2018. You cannot just ignore our voices. If you ratify this Agreement, I will join the campaign for New Zealand to withdraw at the review you have promised within three years. Labour and New Zealand First, you promised no TPPA. The CPTPP is the TPPA in drag. It was unacceptable before and it is unacceptable now. I want you to negotiate agreements that will serve the people of this country, based on the petition presented to Parliament on 8 March 2018, not agreements that profit the 1%. Our Tiriti, not your treaty. 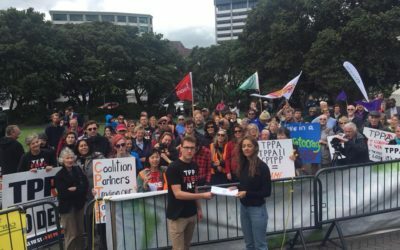 We are a citizens campaign that formed in opposition to the TPPA and other pro-corporate treaties. The Labour-led government has back-pedalled on its pre-election rhetoric and now plans to sign the TPPA-11 (now rebranded the “CPTPP”) on 8 March 2018. The text of the TPPA-11 is the same as the original TPPA, with a small number of provisions until the United States rejoins. 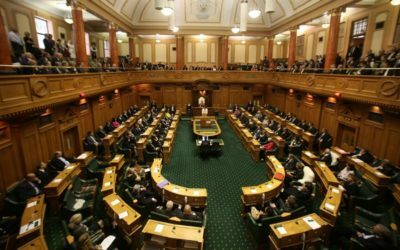 The negotiations are still secret, and the threats to the regulatory sovereignty of the New Zealand Government remain the same.